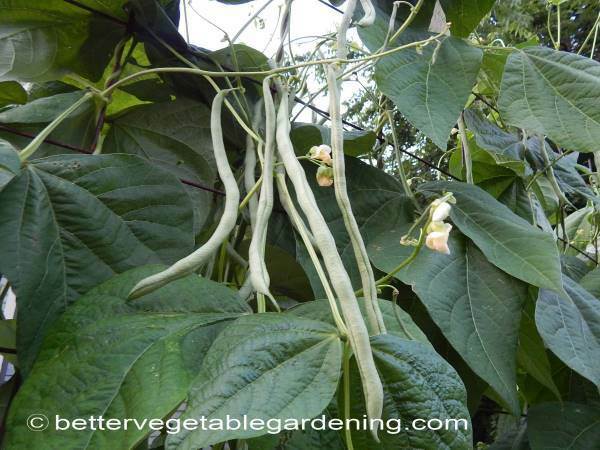 Pole beans or climbing beans are great in any garden situation but really good in a small garden with limited space. 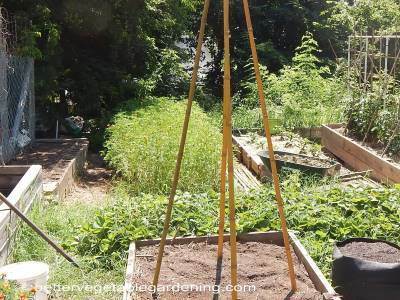 Going vertical allows you to grow an abundance of beans in a fraction of the area needed for bush beans. Growing conditions for pole beans are pretty much the same as for bush. They are a frost tender, warm season vegetable needing soil temperatures of at least 60F (16 C). The seeds tend to crack and germinate poorly, or rot very quickly in cold wet soil conditions. Pole beans preferring a sunny position with a very minimum of 4-6 hours of direct sunlight daily. They grow best when temperatures are in the range of 70-95 F (21-35 C). Beans like well-drained soils rich in organic matter with a pH above 6.0. Planting pole beans should be left until at least 1-2 weeks after the last average 32 F (0 C) freeze in your area but not before soil temperature are consistently 60 F(16 C) or above. A valuable piece of information for gardeners to know is the date of the last frost in the spring and the first killing frost in the fall. to help plan your planting. While you can buy bean plants from some nurseries most bean varieties will germinate in 6-8 days from sowing and transplanting is not considered a viable method. 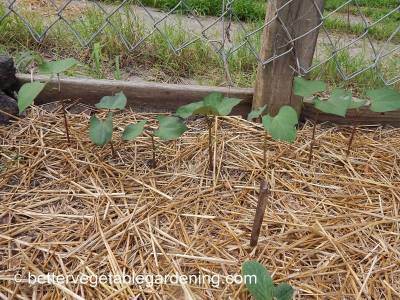 For best results all bean types should be direct sown to the garden. Sowing pole or climbing beans: sow seeds 4-6 inches (10-15 cm) apart in rows 30-36 inches (75-90 cm) apart. It is best to have some means of support or trellising in place at planting time. 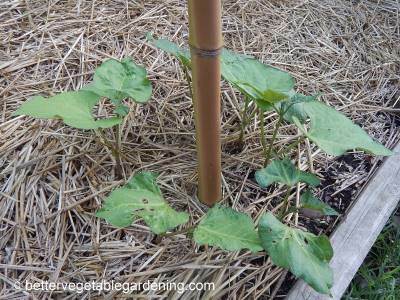 Pole beans can also be grown using poles in a teepee type structure for supporting the beans. Use as many poles as you see fit, there is no hard and fast rule. Sow 4-6 seeds per pole and thin them out once germinated. Using trellis support: Thin to the strongest plants, 6-8 inches (15 - 20 cm) apart. There is no need to get out a tape measure the spacing given are just a guideline. Sometimes spacing will be less or more for different reason. 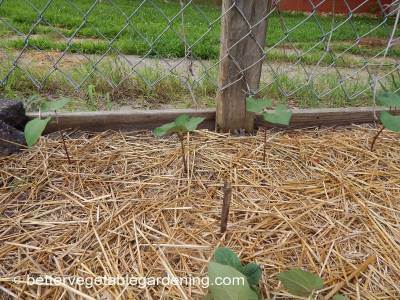 The important part is to thin them out, overcrowding plants when growing pole beans will reduce total crop production. This is one time where more is not better. Using pole support: down to the strongest 2-3 seedling. 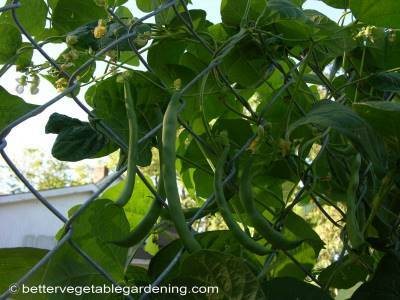 As with growing pole beans alone a trellis, thin them out so they are not overcrowded. Beans have shallow roots and frequent cultivation and hoeing will cause damage to the root system. Keep weeds down from the beginning and use a good thick mulch. to stifle the weeds. 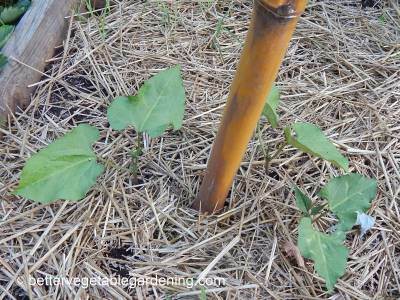 Weeding pole beans is much less labor intensive than with bush beans because of the reduced garden area they occupy. Beans, like most other vegetables, need consistent soil moisture. Damp but not soaking is the best way to describe watering beans. Retaining soil moisture is yet another good reason for using mulch. Beans are a legume and therefore are nitrogen fixing, however common beans are poor fixers and fix less than their nitrogen needs. So while their fertilizer need are considered low compared to other vegetable that doesn't mean no fertilizer. Apply 2-3 quarts per 100 sq feet (approx 2-3 liters per 10 square meters) before planting of a good all purpose Organic Fertilizer and the same rate for each side dressing. Apply fertilizer 2 - 3 weeks before sowing again as the first flowers are setting and 2-3 week intervals after that. Pole beans are very robust and will climb up anything within their reach. The growing stems are strong and don't need much in the way of support. However they are heavy croppers and if you want them to stay upright a good stout external frame is needed. As in this photo the internal support is nothing more than thin string netting. However the external frame holding everything together needs to be robust. This can be made from any material including, bamboo cane, PVC and steel piping or wood. 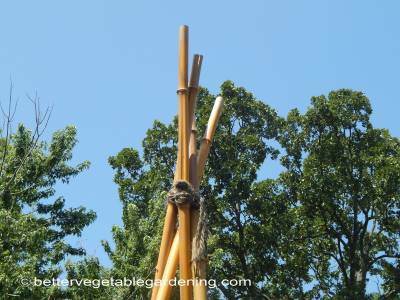 Similar to trellising support, the traditional teepee type structure used for supporting pole beans can be constructed from many different materials. 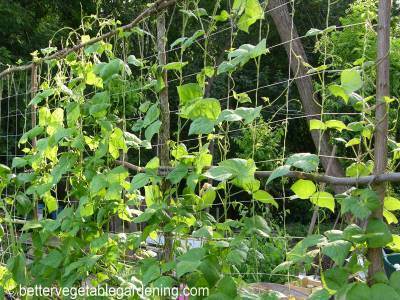 Use 8-10 foot (approx 2.5-3.0 meter) poles for supporting the beans and tie them all together at the top. I would like to show a really fancy knot for doing this but alas I didn't use one. Crop rotation is as important with beans as it is with other vegetables. This is mainly to reduce the incidence of pests and diseases carried over in the soil from the previous year’s bean crop. Growing pole beans, depending on climate and variety, will take around 65-70 days from germination to maturity of the first wave of beans and will continue until climate and soil conditions become unfavorable. It is important to pick beans daily while they are still young and the pods are bright green, fleshy and the seeds small and green. If too many pods are allowed to reach maturity the plants will slow down in producing new pods, so picking regularly will insure the plants produce their maximum yield. Pole beans are best stored at 40-45 F (4-7 C) with 95-100% humidity. Fresh green pole beans can be stored for up to 8-12 days in these conditions. Green beans can also be canned or frozen with great success.